Each RELOVEDLUMBER sign is handmade to order with high quality, 100% solid wood. Each piece has its own natural imperfections, such as holes, knots or other blemishes which we do not attempt to hide in any way. 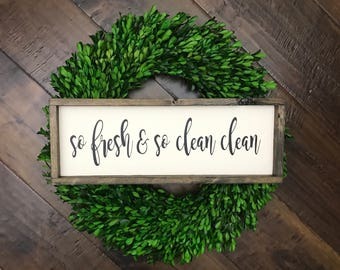 We feel this is what gives our products their uniqueness and that farmhouse charm we all know and love. Since each piece will take to our creation process slightly differently, no two signs will be exactly alike. We get asked about our wreaths ALL the time. We know you love them, and we do too, but unfortunately they are not for sale. We do NOT make or sell wreaths at this time and they will NOT be included with sign purchase. Signs can stand alone or be hung. Hanging hardware is included but NOT installed. Every sign, with the exception of the 7” mini size, comes with an easy to install sawtooth hanger that holds up to 50lbs. The 7” mini size is light enough to be hung with a simple command strip (not included with purchase). No damage to your new sign, no damage to your walls… perfect! RElovedLumber has decided to go paperless! In an effort to be more environmentally conscious, as of July 1, 2017 we will no longer automatically include a packing slip with your order. Gift notes can be added to any order by visiting the “Add-Ons & Upgrades” section of our shop or by clicking on the link below. The gift note add-on includes a hand written gift card, envelope, and twine wrap around the sign. When purchasing the gift note, please leave your note to recipient in the NOTES TO SELLER section at checkout. Please be sure to double check all spelling and punctuation as your note will be written exactly as entered. Local to zip code 44011 and want to pick up your sign instead? Message me prior to placing your order for a coupon code to void shipping costs and to arrange local pickup. Please remember to check your shipping address PRIOR to submitting your order. All orders will be sent to the address on file, no exceptions. If you realize after placing an order that your shipping address is incorrect, please get in touch with us immediately. One of two things will happen- you will either need to place a new order with the correct address and once the new order is placed, the original order will be fully refunded back to the original payment method; or in some instances, we will be able to send an additional listing to simply cover the difference in shipping cost. Please keep in mind that RElovedLumber is NOT responsible for non-delivered or mis-delivered packages due to incorrect shipping addresses. If a package is returned to us or delivered to an incorrect address, buyer will be responsible for additional shipping costs and, if needed, the cost of new sign(s) to replace. Due to the nature of our work and the fact that orders are begun immediately, we do NOT accept order cancellations at this time. Please keep this in mind when making your purchase. Any questions? Don't hesitate to ask! Don't forget, we also accept custom orders! © 2019 RElovedLumber. All rights reserved. My best friend absolutely loved this gift! Do the signs hang on the wall or sit on a shelf? Completely up to you! They can stand alone or be hung. All of our signs, with the exception of the 7" squares, come with 50lb rated hanging hardware. The 7" signs are small enough and light enough to be mounted with a simple command strip (not included). For safety reasons, we do NOT install the hanging hardware. Don’t see what you’re looking for? Let’s chat! Message us about creating something just for you. Custom orders can be purchased through a private custom listing only. Once purchased, design work will begin and you will receive a mockup for approval. Our custom orders include up to three full revisions of that initial design, so we’ll make sure you 100% love it before we get to work handcrafting your new sign. Due to the nature of our work and the fact that orders are begun immediately, we do NOT accept order cancellations at this time. Please keep this in mind when making your purchase. In some rare instances, an exchange may be allowed. Buyer will be responsible for all shipping costs. All signs, unless otherwise specified within the listing, are an ivory base color with black text. Most listings also offer the option of a Black or Grey base color with white text. All frames, unless a Stain Upgrade is purchased, are a medium/dark brown wood stain. Stain upgrades can be added to any order for $2.50 per sign. Stain upgrades include Black Stain, Grey Stain, or no stain at all. Keep in mind that due to individual computer monitors, cell phone screens, tablet screens, etc. colors may vary slightly from what you see in listing photos. The size of each sign or sign set can be found within the Item Details section of the listing. All sizes are approximate by up to 1” and are not guaranteed to be the exact dimension listed. Why did I not receive a packing slip with my order? Of course, if you would like a packing slip for any reason, just send us a message or leave a note when making your purchase and we will be sure to include one with your package. 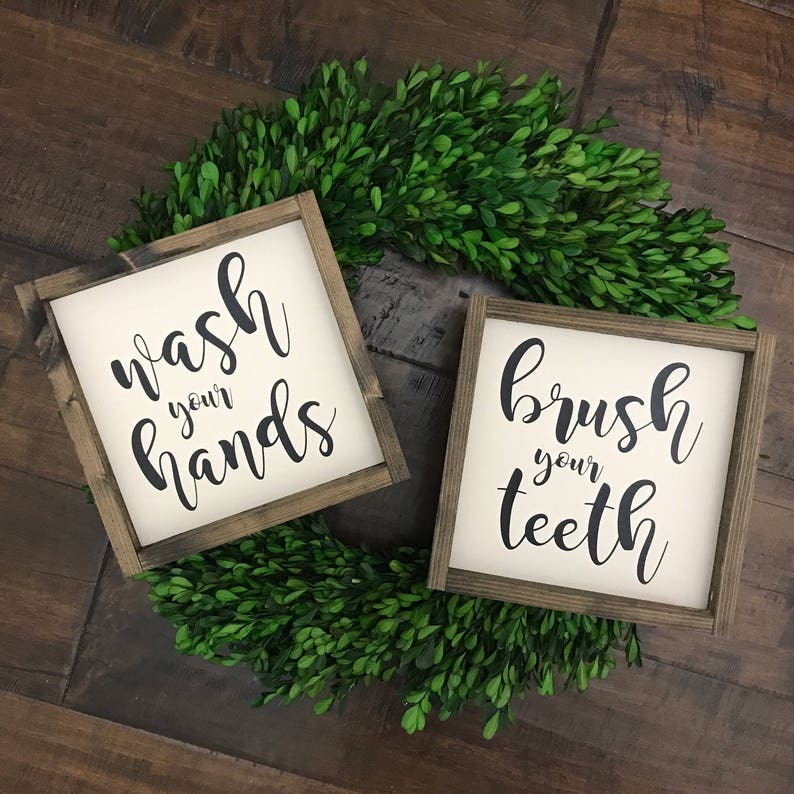 Do the wreaths or accessories come with the signs? Wreaths and/or photo props/accessories are NOT included with sign purchase. If you are interested in purchasing a wreath of your own, feel free to send me a message and I will point you in the direction of where to find them. We do not make and/or sell any wreaths at this time. Please message us PRIOR to purchase to receive a code to void shipping costs. Orders MUST be picked up in person within three days of completion. If the order is not picked up within three days of completion, buyer will be responsible for shipping costs via private listing, or order will be cancelled less a $25.00 restocking fee*. If a local pickup time and place is set and the buyer does not show and does not make prior arrangements with seller, and/or does not respond to messages regarding their no-show, the order will automatically be cancelled less a $25.00 restocking fee*. *This means that the buyer's order will be cancelled and only funds exceeding $25.00 will be refunded. If your item(s) arrive damaged, please bring this to our attention within 48 hours of delivery. We will require three (3) or more photos of the damage, including an additional photo of the packaging. We will assess the damage and work with you to find a solution. Please remember to check your shipping address PRIOR to submitting your order. All orders will be sent to the address on file, no exceptions. If you realize after placing an order that your shipping address is incorrect, you will need to place a new order with the correct address. Once the new order is placed, the original order will be fully refunded back to the original payment method. RElovedLumber is NOT responsible for non-delivered or mis-delivered packages due to incorrect shipping addresses. If a package is returned to us or delivered to an incorrect address, buyer will be responsible for additional shipping costs and, if needed, the cost of new sign(s) to replace. When a package is shipped internationally, it may be subject to import taxes, customs duties, and/or fees imposed by the destination country. These charges will typically be due once the shipped goods arrive at the country of destination. RElovedLumber is NOT responsible for these additional charges, if any. Buyers are responsible for any additional costs such as duties, taxes, and customs clearance fees. Import charges can vary widely but are most commonly based on the price and type of item, package weight and dimensions, origin country, and the taxes, duties, and fees of the destination country. RElovedLumber reserves the right to reproduce custom made items. We also reserve the right to photograph all items we create and may use them at our discretion for advertising or as samples inside our listings. All photos of completed work are the property of RElovedLumber and cannot be used without our permission.